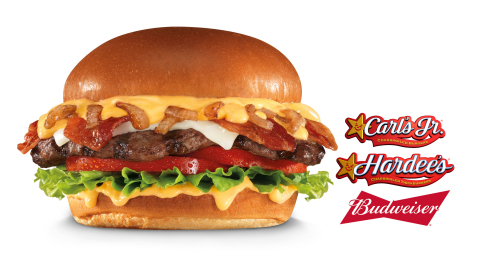 America’s leading brewer, Anheuser-Busch, partners with Carl’s Jr.
chain today,” said Brad Haley, chief marketing officer for Carl’s Jr.
as on the chains’ YouTube channels. patty for $6.89, and as a 100 percent Black Angus beef, 1/3-lb. restaurants in 44 states and 39 foreign countries and U.S. territories. have carried on a legacy of brewing America’s most-popular beers. and Wine categories, respectively, by Ace Metrix® in 2014.
distributing operations by 2018. Its flagship brewery remains in St.